Below the video is an exclusive review from Important Media’s Robyn Purchia. She focuses on how much better the 2016 Chevy Volt is for the needs of a young family (compared to the 1st-gen Chevy Volt). Before sharing that, though, here’s a video in which Pam Fletcher, Executive Chief Engineer of the 2016 Chevy Volt, discusses what’s new and better in the 2nd-gen Volt. 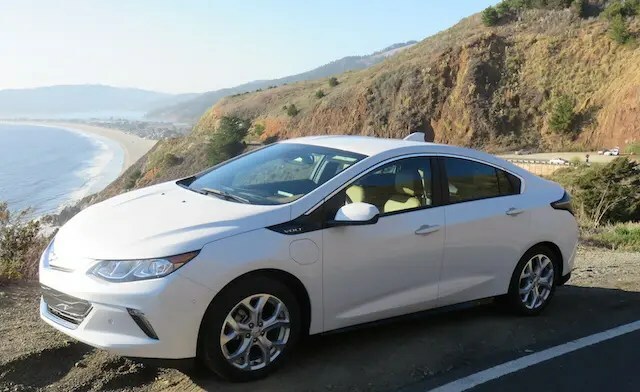 This week, Chevrolet hosted the 2016 Volt media drive outside San Francisco and I was one of the fortunate few who got to check it out and drive it up the beautiful California coast. Many have gushed about the new model’s improvements over earlier Volts — particularly, range (I drove 59 miles on battery power alone, and I heard someone on an earlier drive reached 62 miles), sound (or lack thereof), and responsiveness. But I was there to answer one question: Is the 2016 Chevy Volt more family friendly than earlier models? When the Volt first arrived on the scene in December 2010, Chevrolet wanted to appeal to early adopters. Customers at the time not only loved the car for its fuel efficiency, but also for its high-tech, space-age interior and futuristic design. Many actually decided to trade in their Toyota Prius for the Volt because it just seemed more fun to drive. But I’m not easily taken in by fancy lights and lots of buttons. In fact, my husband and I decided to lease a 2015 Toyota Prius V last year instead of the 2015 Volt because we were expecting our first baby and the four-seater Volt just didn’t make sense. We needed room for the car seat and a big trunk where we could fit the stroller. When I spoke to Darin Geese, a product manager answering questions at the media drive, he told me I wasn’t alone. Others voiced similar complaints to Chevy and the car manufacturer listened. I hauled my Chicco KeyFit 30 infant car seat and Chico Multi KeyFit caddy (i.e. 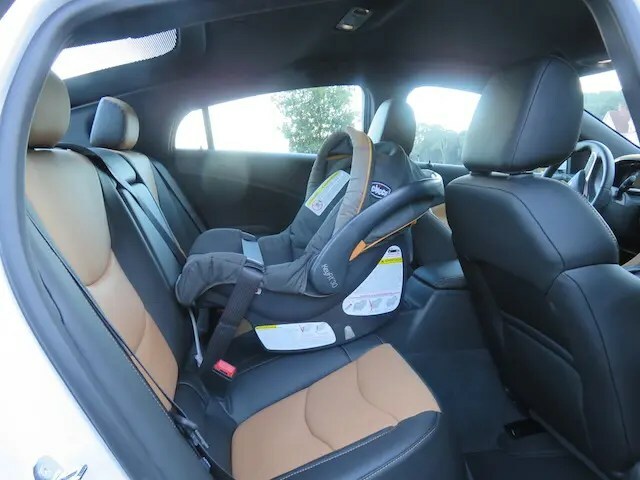 the stroller) to the drive to see if my little family could fit in the 2016 Volt and test whether Chevy did, indeed, create a more mainstream, family-friendly vehicle. There was plenty of room for me to strap the car seat into the 2016 Volt’s new middle back seat. Unfortunately, I forgot to bring the base, so I don’t know how much extra room that will take up. But my guess is that even with the base, there would be enough space for an older sibling, parent, grandparent, or friend to sit next to the car seat. Putting the stroller in the trunk wasn’t as easy. After playing with it a bit, I did find a way to fit it in successfully. But the stroller I have is very small and lightweight — designed for parking it in tight spaces in San Francisco. If you have one of the double or sport utility strollers — the kind that are like motor vehicles themselves — you may have more difficulty making it fit. I spoke with Communications Manager Michelle Malcho, who has been lucky enough to drive her family around in a 2016 Volt for the past two months. Before making the switch to the Volt, she drove a Buick Enclave, which is pretty spacious vehicle. However, Malcho assured me her 18-month-old little girl has plenty of space in the new ride. Plus, she raved about how quiet the 2016 Volt is. “I can hear every little giggle, every little noise she’s making,” Malcho said. I would probably love the quiet for a different reason — my 9-month-old son might actually fall asleep. But if all I’m hearing are giggles, I can live with that too. I’ve always been concerned about the environment, but after my son was born, my desire to improve the world for future generations has only gotten stronger. I want a car that’s good for the planet, but I need a car that has space. The 2016 Volt finally gives me both. 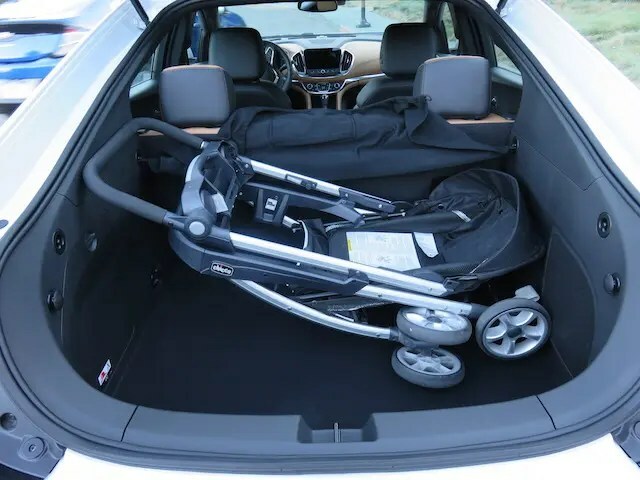 While the trunk could use more room for strollers and baby equipment, the back middle seat is a huge improvement over earlier models. And there’s just something to be said about driving an American-made, incredibly fuel-efficient, high-tech vehicle like the 2016 Volt. I think we can safely say, Chevrolet has succeeded at going mainstream.